Udemy for Business helps companies stay competitive in the digital transformation of the workplace by offering fresh, on-demand learning content powered by a content marketplace. The company’s mission is to help employees do whatever comes next- whether that’s tackling the next project, learning a new skill, or mastering a role. Udemy for Business does this by curating 2,500+ of Udemy’s top-rated courses taught by the world’s leading experts. The company’s content covers key business and technical topics ranging from development and IT to leadership, marketing, design, stress management, and much more. In addition to a curated content collection, organizations can host and distribute their own proprietary content on Udemy. Leading organizations including PayPal, Lyft, Booking.com, Pinterest, Adidas, and HSBC choose Udemy for Business to upskill their workforce and drive learning forward. Udemy for Business sells to medium and large organizations through a typical enterprise sales process. To handle demand efficiently, the company also set up a self-service system that permits smaller teams to purchase licenses without engaging sales. Unfortunately, self-service for enterprise was originally a manually-managed process that left much to be desired. Udemy sales development representatives (SDR) would painstakingly enter payment and contract information manually into the company’s Salesforce and CPQ instances, which was a time-consuming and error-prone process to begin with. “It just wasn’t sustainable,” says Passanisi. Even more frustratingly, important features in Salesforce CPQ, such as the ability to amend or update contacts, weren’t available via its API - the interface that software applications such as Salesforce and Stripe use to connect to each other to enact joint functionality. This meant that updating contracts after the fact required even more manual work. To tackle this issue, Udemy looked for integration solutions to flow important contract data between Stripe and Salesforce. Udemy’s initial search turned up alternatives that ultimately didn’t work for the education leader. Right off the bat, Salesforce’s own built-in Process Builder tool wasn’t robust enough to handle the cross-application processes the company needed. The company’s search for external solutions unearthed one option, a small- and medium-size business (SMB) tool, which ultimately didn’t meet the company’s security requirements. Another external option turned out to be a clunky, enterprise-grade tool whose outdated interface required development resources simply to use. Finally, Udemy discovered the Tray Platform, a SOC2-certified solution that offered all the integration and automation functionality the company needed, with an easy-to-use visual editor that would let Udemy’s team build whatever processes they wanted themselves, without the need for expensive development resources. 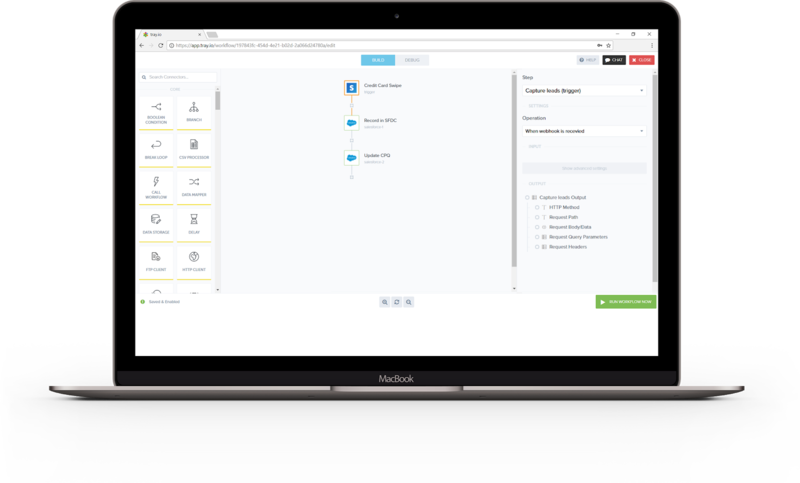 Partnering with Tray’s customer success team, Passanisi was able to get a working prototype of a workflow that incorporated Stripe and Salesforce CPQ up and running within a few hours. The Tray Platform is built on serverless, API-first architecture that connects to the deepest levels of cloud-based applications like Stripe and Salesforce. Using the platform, Passanisi and his team were able to integrate Stripe’s payment processing features to Salesforce and Salesforce CPQ to connect initial credit card swipes to the rest of its account infrastructure. Udemy has a highly customized instance of Salesforce that integrates Salesforce CPQ for pricing and contract processing, but using the Tray Platform, the company was able to connect payment data to contract information to Salesforce account listings, even directly incorporating contact info updates within Salesforce CPQ. With successful Stripe-to-Salesforce-CPQ integration for enterprise contracts in place, Passanisi’s team members saw direct improvements to their daily work, as well as to the company’s bottom line. Previously, the company had compensated its SDR team for taking on the arduous work of entering enterprise contact info manually, but this clearly wasn’t a good use of either the company’s resources or its team’s time. 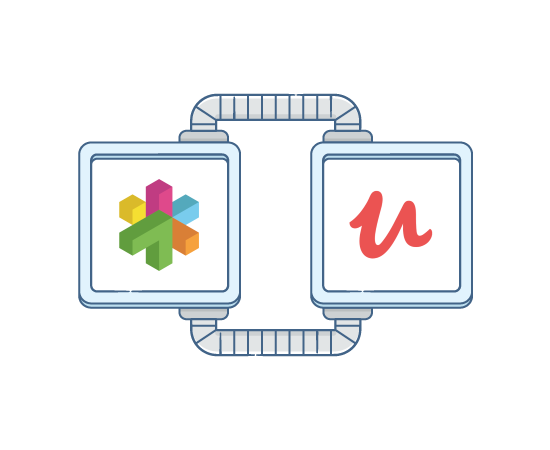 With the new automated process in place, Udemy realized time savings of 20-25 hours per month, and an increase in efficiency by turning time-consuming, error-prone manual labor into a seamless, automated process. The company redirected its SDR team’s time away from manual data entry to focus on what they had been hired to do. Udemy also recorded hard savings of approximately $1,000 per month from no longer having to essentially compensate its SDRs to close an internal gap in its tech stack - and could instead fully focus on compensating them for actually bringing in new sales opportunities. Udemy is already investigating the Tray Platform to integrate its Salesforce instances with the popular enterprise resource planning (ERP) solution Netsuite to handle its internal finance and budgeting processes.